Makeup is applied to make a woman look more beautiful. 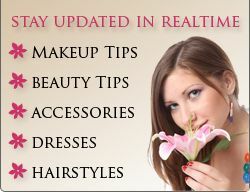 Foundation, blush, eye shadow, lipstick, concealer, mascara, eye liner and lip liner are the makeup products which are used. Everything should be applied with proper care so that face doesn’t look like a mask. Choose the makeup products which suits your skin type. In order to make the eyes more pretty, eye makeup should be done properly. Select eye shadow color according to your choice and the eye liner should be one shade lighter than eye shadow. To define eye lashes, mascara is used. First select the color and the type of mascara which you want to apply on the eye lashes. Generally black or brown among colors are picked but you can choose other colors too. Stand in front of the mirror and with the help of brush put on mascara on the lashes. For the upper lash hold the brush in the horizontal way and put the mascara in upward manner. Make sure to use a lash comb to properly settle the mascara so that it doesn’t make the look of eyes ugly. Use it before the mascara dries out as it would fall off once dried. For the lower lash, keep the brush in vertical manner and put mascara in a little amount. Always make sure that you apply mascara from the root to the tips of lashes as it stand out odd if mascara is not applied properly. The above tips will help you out to apply mascara. Mascara is used to give definition to the eye lashes. If you are wearing contact lens then it is advisable to apply mascara first on the lashes with somebody’s help and then wear on the lenses. Wearing lenses first and then applying mascara can damage the lens. You should take time to apply mascara as if you apply it in hurry then it can spoil the look. Make sure that mascara doesn’t dry out while you are still applying and so it is advisable to switch off the fans. To get a bold look, you can apply 2-3 coats of mascara with other makeup products in a correct manner.